The Spectrum Light Gun was an interesting device. Shaped like a weapon that would have looked good on Blake's 7, it was actually quite spiffy as far as light guns went... at least back then, anyway. Allow me to reminisce for a minute. It's Christmas 1989. I've received my beloved Spectrum. Fairly late to the party, it's a +2A model, and with it comes the light gun and 6 games. Yes, if you're a regular reader (don't think I have any of those, but it'd be nice), I've told some of this story before, but allow me to bore you further. The six games are actually all pretty good, really. And all fairly varied, as much as Light Gun Games can be at least. Sure, a few of them might have been subject of some scathing reviews, but what you have to bear in mind is that when these were reviewed at the time, the term "value for money" probably resulted in a great reduction of the scores. This I cannot argue with, when the price of the pack (a princely £30 or so at the time) is taken into account, compared to other compilations such as, for example, Konami Arcade Collection (10 games) or Winners! (5 games) or The Biz (4 games but 3 of them were Your Sinclair Megagames), which usually retailed at around £15... I think you see where I'm coming from. Anyway, enough yarbling, onto the games. First up was always going to be the "flagship" arcade conversion, Operation Wolf. Unfortunately, I've already reviewed it, so rather than a feeble copy and paste, I'm simply going to link to that review (which rather handily covers the original arcade game too). So click here and off you go. Next up was Bullseye. You know Bullseye, staple of Sunday evening TV in the 80s, before Gladiators came along of course. 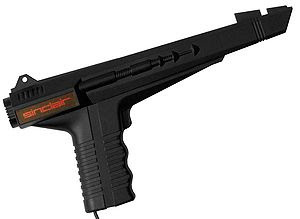 Anyway, based on the hit quiz show (which has had something of a resurgence on Challenge TV in recent years), the gun takes care of the dart throwing (or arrows as they seem to be referred to), but you have to have the keyboard in reach to be able to type your answers quick enough. There doesn't seem to be a massive variety of questions, ones about John Frieda's girlfriend (Lulu) and The Venerable Bede seem to repeat themselves with alarming regularity. Overall, I personally found this game to be the weak link in the whole package. The targeting sometimes seems way off, you can barely move the gun, fire all 3 darts, and 1 of them will find it's way to the far edge of the screen while the others rest firmly in the treble 20. Because it's not a fast action game, there's no issue with slow-down from firing too much, but still, it remains relatively unexciting compared to the rest. Next up is Missile Ground Zero. Think "Missile Command", but rather than a trackball and slow missiles, you can target instantly with the gun and shoot at the tiny little things that fall from the sky threatening your cities. Each shot is shown as an explosion on screen, and whilst the white flashes may affect those with photo-sensitive conditions, the action doesn't slow down, and is fast and frantic. Better still, the game features some of the best music of ALL TIME on the Spectrum. And! AND! AND!! It takes about 45 seconds to load from tape. (Memory fading, but it seemed that way, I know it didn't take long). Sure, it's repetitive and it's basic, but by the hell it's a blast of fun, and for such a quick load, I probably played this game more than any other. From there, we go to Robot Attack, now this one is a little bit disappointing. Made by the same folks and featuring the same music as Missile Ground Zero (which is a highlight), the game itself is a little bit poor in comparison. Robots walk along the platforms, you have to shoot them a number of times according to what colour they are. Some robots are indestructable, some will collapse when shot, get repaired and come back a different colour. If a robot reaches a crate, they build part of a "Mega-Robot", which, if completed, will spell game over for the human race. Or something. There's power-ups with varying effects, but to be honest, you'll probably play this a couple of times and have had enough by that point. The final two games in the package are real gems, and more than make up for any disappointment you might have felt by Robot Attack and Bullseye. Which is better? Erm... I couldn't really choose. First up then, is Solar Invasion. Massive aliens are attacking our Solar System, these massive aliens release little baby aliens that will evolve before your very eyes, eventually becoming equally massive aliens. The object is simple enough... destroy them all before they destroy the human race. You basically drift around space a bit, aided by a radar to help you find the alien scum, as well as ammo pickups and smart bombs. Shooting the little arrows at the top and bottom of the status panel will rotate your direction accordingly, and, as with all the best simplistic concepts, that is pretty much all you need to know. By the time you reach the last few levels, you'll see just how quickly the aliens evolve, be prepared for some fast and frantic shooting to stand any chance whatsoever of completing the game. I never quite made it. Rookie is a target shooting game, and a mighty fine one at that. It tests your reactions and accuracy, pitting you against the clock to reach the required score on each level. The action takes place over a number of screens (I think it's about 20, I can't remember), on each one a number of targets will begin to appear, as each one does a number appears on them, beginning at 100 and counting down to 0. Shoot the target too early you'll get no points. The quicker you shoot from the moment 100 is displayed, the more points you get. Ammo is limited, so you can't go crazy. Fortunately, once the last target has appeared, you'll start getting bonus ammo signs in the corner of the screen. If you have enough time to stock up, you can hang around and shoot these for an extra 10 bullets each time, or you can shoot the arrows to proceed to the next screen, where there will be more targets. Guess what? ONCE AGAIN, simple concept, simple fun. It works brilliantly and the game caused great competition between me and my family. Which is where this game gets my ultimate seal of approval. My sister was actually quite good at this game, but she could never put her name in the high score table. Why not? Because as soon as she typed in her name, it replaced it with "Hi there, Smudge Face!" We never understood why. Anyway, the mystery is solved, I emailed a chap called "Equinox" who had a page on Spectrum "Easter Eggs", and told him about that particular incident. Within 24 hours, he'd gone through the game's code and found several other things you could type in on the high score table... only to be replaced by something else. Who "Lynn" is, although the code seems to reveal her surname may be "Fairclough", remains a mystery. But thank you, Peter Gough, for the amusement you provided me and my sister.